What does that even mean? Well, the “full access to .net” thing has to do with the fact that in order for a PCL to work it has to restrict the framework to the lowest common denominator of what’s available for the platforms you select. The more platforms, the more restrictive the PCL becomes. When you add a PCL to any standard .Net project you actually get a dialog that lets you pick which “targets” (platforms) you want to support. 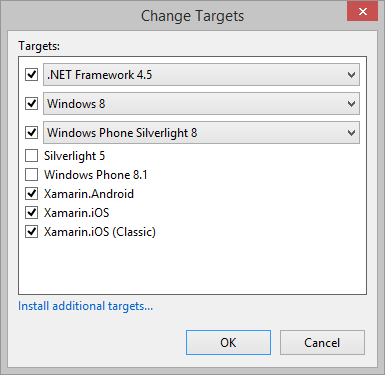 When you select PCL as part of a Xamarin Forms project those platforms are selected for you and include iOS, Android, Windows 8, and Windows Phone 8 (aka “Windows Phone Silverlight 8”). That brings us to the third item, IOC. Inversion of Control is a fancy way of describing how you’d structure your code to accept an “Interface” as a parameter for a particular function and then any object that implements that interface, even wildly differently, would be considered a valid parameter. Since a PCL can’t do the #ifdef trick you’ll probably need to rely on a form of IOC so that you can define an Interface that represents a piece of platform-specific functionality you need, then implement that Interface for each platform and at runtime reference that implementation via Xamarin’s built-in DependencyService or a more robust IOC technology of your choice (TinyIOC, Autofac and a number of others are in common use with Xamarin and can be installed via NuGet). After all that it starts to sound like the Shared Project approach really is a lot less complicated to work with and less restrictive as well! Yup, that was my thinking and for a few months I was pretty well convinced that Shared Project was clearly the best path to follow. The problem was, the rest of the world didn’t seem to see it that way. It wasn’t that anyone flat out said I was wrong – heck, Xamarin continued to be neutral on the matter…all the while pumping out new code examples that all used PCL for shared code. Hmmmm. After building out a pretty sizeable app of nearly 20 pages following an MVVM pattern I learned quite a bit (much of which will show up in subsequent posts). About PCL I learned that not once did I run into any “limits” beyond the HTTPClient thing I mentioned earlier. I did have a few of those situations where I needed slightly different values for a variable based on the platform but I found I was able to do that in the PCL, without Interfaces and IOC, through the use of a static Device class in Xamarin. It exposes a number of helpful methods that let you make decisions at runtime based on the specific platform you’re on and also gives you access to a number of platform-specific values and helpers. Parts of this even extends to your XAML markup so that based on the platform at runtime you can have different values applied in XAML. Through experimenting I quickly discovered that this approach to handling small bits platform-specific code was far better than the #ifdef approach that seemed so appealing before. In short, by going through the process of building out a real-world application using PCL I inadvertently debunked every PCL “limitation” I had previously called out and developed an appreciation for a few PCL advantages along the way. I also no longer felt concerned or confused when looking at the many sample apps and other blog posts that more often than not used PCL projects; I now followed that same familiar path and can more easily understand their guidance in the context of my own application. Thanks for sharing your experience, Ken! Hi, Thanks for explaining it very easily. Now, i feel much more confident about select either of them. But, when i was working with PCL, i had to use ipaddress and socket related classes which were not available for PCL, which made me to move back to classic Xamarin.Android and not Forms. There could be situations where PCL has a limitation and that’s where you can either use injection or add a Shared Project just to handle that one area of functionality. In either case it doesn’t mean you need to move back to Xamarin Classic though; you can still use Forms whether you’re using PCL or Shared Projects (or both). Forms is really just a UI library that sits on top of Xamarin Classic so you always have that available to you anyway. Thanks Ken, this will help me drastically in my current mid size project. Great article – well thought out, thank you! Have you ever tried building a project to target regular Windows and a mobile OS? By that I mean like a WPF application in Windows 7 instead of Windows 10 UAP, Windows Phone, etc., which isn’t Xamarin Forms compatible? I’m looking at trying to develop PCL’s for a WPF for Windows and an Android app. I’ve not tried a mixed environment with WPF and Xamarin but my guess is that you’ll run into some challenges trying to find a PCL profile that will work well across all environments. This might be a case where the Shared project approach works much better. Hi, Ken. Great article thank you for writing it. What is your opinion about using .NET Standard with Xamarin? It seems that this will be the next step for PCL. Yeah, I’m watching that pretty closely; it does seem that the writing is on the wall for there to be an implementation of .Net Core that takes the place of PCL for platforms like Xamarin. Personally I’m very much looking forward to it! Thank you very much !! The way you explained is very good..!!! A very well explained article with clear explanations and examples. Many thanks for taking the time to produce this.